Made by Feather. 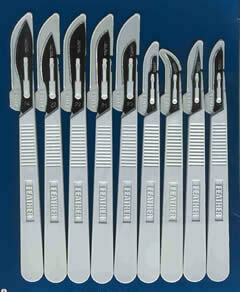 Sterile, stainless steel disposable scalpels with a handle; packed in aluminum foil, in a variety of sizes. Made from tool steel wire. Sharpened to microsurgical quality. 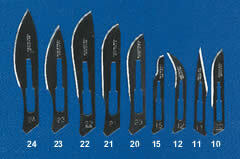 The knife-edges are available in three different configurations: 45, 30 and 15 degrees angle. The handle is plastic and they come sterile and in a blister pack individually, 6 blister packs to a box. 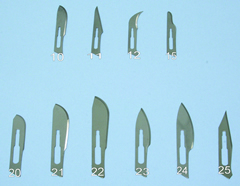 These blades are the finest and sharpest blades for all of your micro-surgical needs. They are made from a polycrystalline CVD blade and are plasma sharpened. Available in several different sizes and with aluminum or plastic handles. The broad non-flexible blade features an extra thick cutting edge perfect for cutting dense tissue. The top edge can be struck with a mallet to hammer through hard tissue and/or bone. The length of the knife is 10" (254 mm) and it is made from heavy duty stainless steel. This extra thick, rigid stainless steel blade is perfect for cutting hard tissue. 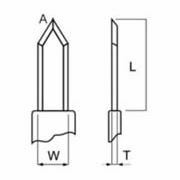 Features a thick tapered edge with an optional 40 mm imprinted metric ruler. 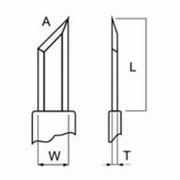 The top edge is 0.062" (1.6 mm) thick and tapers into the sharp cutting edge. 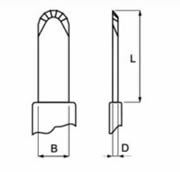 The blade measures 8" (203 mm) (L) x ¾" (20 mm) (W). The overall length is 13" (330 mm) and it is made from standard grade stainless steel. This dissection knife is lightweight and perfectly balanced with a hollow ground cutting edge. The handle has a smooth top edge for comfort and the blade is hardened to withstand continuous sharpening. The knife measures 11¾" (299 mm) x ¾" (20 mm) and it is made from premium grade stainless steel. These all-purpose autopsy dissecting knives feature grooved and sleek handles to provide a comfortable and secure grip. Made with stainless steel, these knives feature ridged, tapered blades with pointed tips. They are available in 4 sizes. This long specimen dissecting knife offers a sturdy, but flexible, blade that is excellent for long, continuous, and smooth sectioning. Made with stainless steel, it measures 14" (356 mm) x 1½" (38 mm). 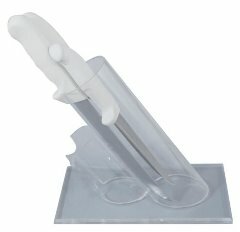 This knife holder was developed by pathologist, David Pinkhasov PA, PhD. It has a simple design that allows the handles to protrude for safe gripping. The double tubes make it easy to organize your instruments, and the angled notches keep the knives separated and ready for use. Simply place your sharp knives in either slot to be kept out of harms way. This holder will accommodate multiple knives of virtually any size and features a perforated base for drainage. It is made from durable heavy-duty plastic to ensure a long life and reduced dulling of your dissecting knives. Our Sani-Safe autopsy grossing knives have plastic non-slip safety handles that comfortably mold to your hand to reduce fatigue, as well as slip guards to protect your hands from the cutting edge. The handle is securely bonded to the cutting blade. The blade is well-balanced, hand-ground and honed, making it the perfect autopsy knife. It can be constantly sharpened for long life and easily sanitized with any disinfectant. These knives are made with premium grade stainless steel and are available in four sizes. *The 14" blade is honed with air-gap grooves. These disposable knives are economically priced and completely disposable. 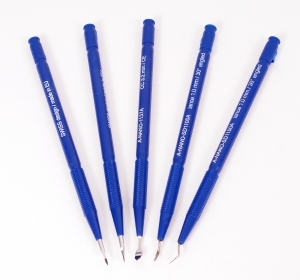 They have double honed, flexible blades with non-slip handles to ensure accurate dissection. They may be stropped for a longer lasting edge. They are available in standard or premium grades of Sheffield stainless steel. These standard grade blades are available in five sizes, 4", 6", 8", 10", and 12", and come 10 per pack. We also offer an assorted pack with two of each size. These premium grade blades are available in five sizes, 4", 6", 8", 10", and 12" and come 10 per pack. This knife sharpener is constructed of indestructible polypropylene. You can sharpen virtually any dull knife with the ceramic rods standing vertically, or laying horizontally, on your laboratory bench top. It is equipped with 3 ceramic rods and can be used for dull or worn edges, partially dull edges, and quick touch ups. 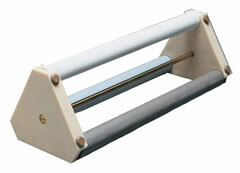 It requires no oil or water and the rods can be rotated for new/clean surfaces to provide a longer stone life. It measure 12½" (318 mm) and includes complete sharpening instructions. Our heavy metal casing sharpener yields incredibly sharp knives for professionals who prefer a perfectly steeled edge. The super-hardened miniature steels use a non-abrasive process to develop uniform, ultra-sharp micro-serrations along the entire edge. This product has two stages: forming and fining, for a razor sharp, longer lasting, double bevel edge. It uses a 100% ultra-fine diamond abrasive and has patented, precision guides for sharper edges. It can be used to sharpen straight edges and serrated knives. 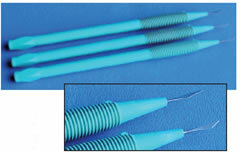 Feather® Disposable Mini Scalpelsare made from heat-treated stainless steel. The blades are smaller than standard blades, come with chemical resistant, slender plastic handle. Handle is 5¾" (145 mm) long. Available in three popular styles: #11, #14 and #15, and packaged in a sterile pouch, 20 per box. ISO 14001 compliant, ISO 9001 certified and ISO13485 certified. Made from surgical carbon steel, size 60 with convex cutting edge. The most useful in histology labs. These scalpel blades are 2⅜" (6cm) long and ribbed for extra rigidity. They are non-sterile and are wrapped individually. Bard-Parker brand. These strong, molded plastic handles provide a secure palm-fitting grip for postmortem work, trimming light plaster casts, and similar forceful cutting. Handle size #6 and #8 Bard-Parker* brand. Handles are sold separately from the interchangeable listed above. Use blade sizes 10, 11, 12, 15 for handle size 5. Use blade sizes 20, 21, 22, 23 for handle size 6. Use blade size 60 for handle size 8. This #3 scalpel handle comes with metric graduations. Sakura Finetek - Extremely sharp and light weight. Designed for surgical grossing and autopsy procedures. Extremely sharp edge allows a wide variety of sectioning and trimming tissue samples. Disposable blades can be easily inserted into handle. 62560-10 4787 Short, Right Handed Please see 62560-01 above. Premiere® Blades are made from carbon steel, individually foil wrapped and gamma radiation sterilized. 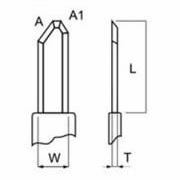 They are exceptionally strong and relatively uniformity sharp, ideal for routine laboratory dissecting, tissue mincing and where you do not need high cost blades. Handles for use with the Premiere® Blades above. Made from carbon steel. Sakura Finetek - These reusable handles and disposable blades are ideal for surgical specimens and dissecting work. These sterile stainless steel blades are available in size #61 and #62 and are approximately 2 inches long. The durable plastic handles are autoclavable. Sakura Finetek- These Accu-Edge® replaceable blade scissors are sharp and prevent cross contamination every time a scissor is used for tissue processing. Blades are made from stainless steel and are autoclavable, corrosion free and easily inserted and removed with the use of an enclosed tool. 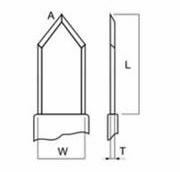 Blades are available separately or as a pair. They are sold 5 pairs per package: sharp-sharp, sharp-blunt, blunt-blunt. 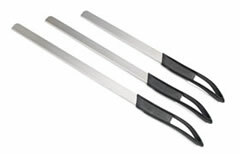 Sakura Finetek - These semi-disposable autopsy knives are made of high quality stainless steel with autoclavable plastic handle which accommodates all three sizes of blades while maintaining optimal balance and control.